MAKING BABIES offers a proven 3-month program designed to help any woman get pregnant. 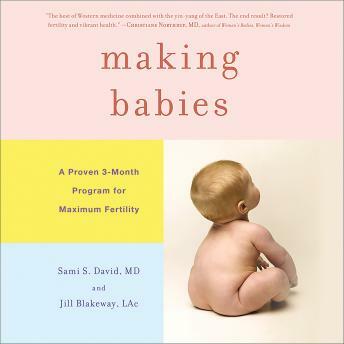 Fertility medicine today is all about aggressive surgical, chemical, and technological intervention, but Dr. David and Blakeway know a better way. Starting by identifying 'fertility types,' they cover everything from recognizing the causes of fertility problems to making lifestyle choices that enhance fertility to trying surprising strategies such as taking cough medicine, decreasing doses of fertility drugs, or getting acupuncture along with IVF. MAKING BABIES is a must-have for every woman trying to conceive, whether naturally or through medical intervention. Dr. David and Blakeway are revolutionizing the fertility field, one baby at a time.